There’s more and more boards out there every day offering a controller, Wi-Fi, and Bluetooth. If that was all the Argon was, we might be praising it for its ease of use. It’s a full featured board, with documentation that’s lighthearted and downright pleasant to study. 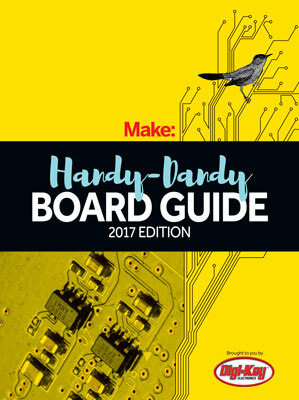 The attention to detail in making this a board that’s quick to learn and prototype with is top notch: You have pins that are brightly labeled not just on the board, but on the headers, too. The dev kit comes with enough bits to test it right out of the box, including a low insertion force breadboard and a USB cable. Even the packaging is clean and uncluttered, with little to distract you from the link to Particle’s “Getting Started” webpage. But Particle aspires to make this as a board you use for far more than making a Wi-Fi-connected gizmo. They hope you’ll use this as the gateway to a full network or swarm of gizmos, built atop their cheaper “Xenon” board. The Argon is everything the Xenon is, a capable microcontroller for messaging over Bluetooth, but with an added processor dedicated to running Wi-Fi. The intent is to make a device that can connect a network of simpler devices back to the Internet over the Argon’s Wi-Fi connection. Used as designed, the Argon is the link back to the Internet for a swarm of devices built atop Xenon boards. Gather up data from a network of Xenon-powered sensors, or send commands to a swarm of robots built with Xenon boards as their brains. Or just use the Argon as an all-in-one Wi-Fi + Bluetooth microcontroller. Any way you choose to use it, the Argon is a capable board, for a good price, with admirable design focus on making it easy it is to learn and use. As a Wi-Fi + Bluetooth capable board, the Argon sets the highest standards for ease of programming and use. As the gateway into a mesh network, it opens up a new kind of device to makers at all skill levels.